Yes! - We do accept custom orders. Prices may vary depending on size and complexity of the piece. Please reach out via Email or the Contact page to begin a dialog on your custom piece. What frame sizes/colors are available? Frames are available in white and black colors. 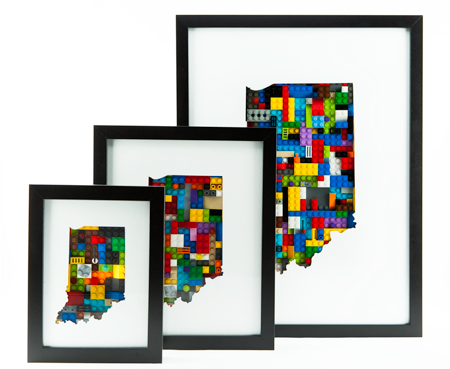 Most designs are available in 5" x 7", 8" x 10", and 12" x 16" sizes (as shown in the Indiana image to the left). Due to silhouette constraints, some designs are limited to certain frame sizes. Can I specify LEGO® brick colors? Yes! - You may specify the class of LEGO brick colors; however, since each piece is a unique work, differences in brick color and position will occur. When can I have my piece? Since each piece is hand made to order, additional time for artwork creation, handling, and shipping are necessary. The typical timeframe from order placement to delivery is appoximately 3 weeks. Due to high order volumes around holidays, this timeline may be extended. 2018 Smitten by Kat. All rights reserved. LEGO® is a trademark of the LEGO Group of companies which does not sponsor, authorize or endorse this site.